If you go to Madrid and walk past the austerity coating everything and enter the Museo del Prado and drift chro­nologically through it, which many do though few can, you end up encountering a melting thought about who and what gets to occupy the center of the canvas. Sacred history gives way to an exclusive portraiture of nobles and kings which then in turn slowly, begrudgingly, admits others within its frame, rich merchants mostly, some clowns and fools, and then even commoners make it into the oil, though usually in groups and either at work or drinking and gaming after, still not admitted to the slow, solitary sitting times of the wealthy. This morphing down through the history of Western painting is often reprisable in the work of a single painter, and at the Prado the most obvious case is Velazquez. When you walk through his work you traverse this same slow accommodation of beings beyond the holy or monarchical, including his famous rehumanizing portraits of court dwarves, but then you are pulled up short in front of a canvas called Cabeza de venado (Head of a Stag). 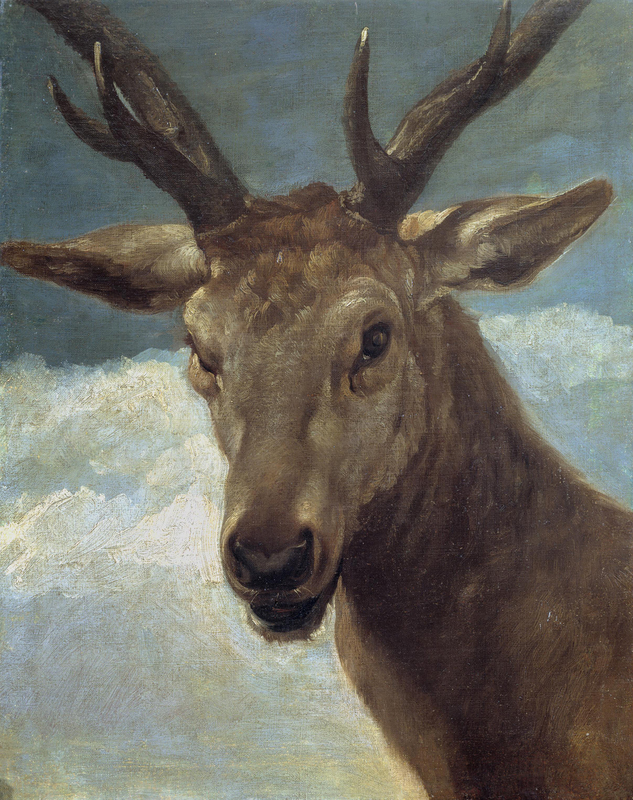 Here, a deer has been swapped into the central space of human portraiture and regards you with a look as fictional yet full as those of Velazquez’s dwarves. The painter’s startling decision opens a temporary abyss behind portraiture’s human face and instead paints that human face’s contingent self-authorization precisely by removing it and showing what else could happen there; traditionally both the subject and object of the gaze, the human face of the observer, including mine, feels different when even a fictive two-dimensional nature stares back. As the end of a sequence of decentering authority that began with kings and nobles and gave way to dwarves and peasants, this deer’s stare still feels social because of its location in that sequence, but it is an impossible sociality because it cannot carry any social meaning even if we grant the fiction of the stag and grant that fiction a mind. It’s embarrassing for everyone, for kings and nobles who are suddenly no more kingly or noble than the stag who supplants them, and for any observer in the Prado, stoned from overconditioned air and the relentless stream of genius, who expects to see yet another face and suddenly finds herself first having to do the more difficult work of granting Cabeza de venado a face before encountering the depths of its flat and impossible stare. It is no longer 1626 or 1635, the possible dates of the painting’s composition, but in 2013 that stag looks as vulnerable to me as it might have at the end of a hunt par force de chiens (in which a royal deer is chased to exhaustion by dogs before being killed by their masters). It looks vulnerable to human economy whether that takes the form of medieval hunting and its hierarchizing functions for aristocracy or present-day territory depletion and population control (something wolves are, or used to be, but which humans can only do). The absurdity of its staring from portraiture, shorn from the universe and pent in a narrow human frame, is now also the obscenity of real deer staring out of a nearly totally built environment (there are only seventeenth-century clouds behind this stag’s head but they will soon scud over subdivisions). With the wolf, their natural predator here in North America, the situation is the same but the absurdity is even more farcical and deadly because it’s an apex predator. 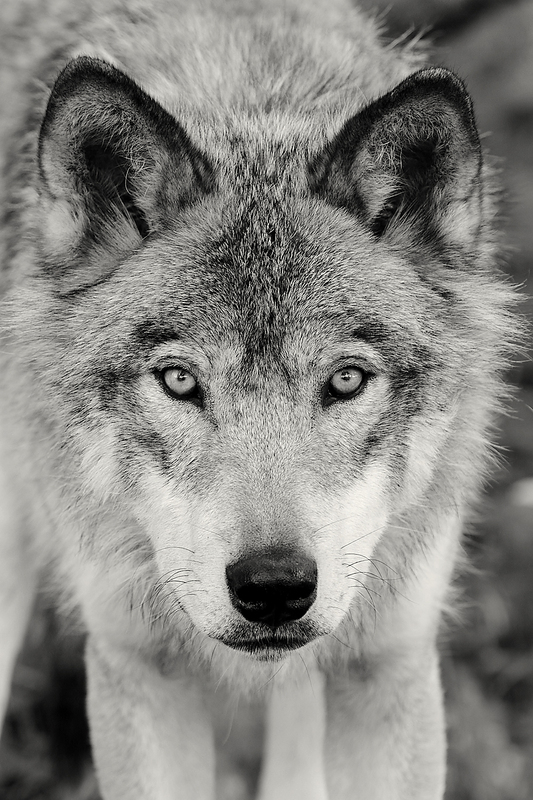 Which means humans find the wolf more comparable to themselves. They too sing, work together, play according to consensual rules, produce hierarchy that in turn produces uneven benefits to the participants. But unlike humans and unlike capitalism, wolves do not produce unnecessary surplus, nor is the uneven distribution of resources in a pack necessarily disastrous. They bother economy and its agents with the beauty of their mere survival, a being-social without money. Livingston. A notorious lone wolf, said to have killed during his lifetime more than $10,000 worth of cattle on the range of Wallis Huidekoper, well-known Montana stockman and president of the state stockmen’s association, is no more. The head now is on display at the local taxidermist’s shop, and Mr. Huidekoper’s cattle graze undisturbed. For fifteen years, Mr. Huidekoper says, the demon ravished his cattle, slipping down almost nightly from the mountains to kill a valuable animal. Year after year all efforts to end the wolf’s career failed, but a few weeks ago the raider was shot and killed. Since that time no loss of stock has been reported. The wolf can be both demon and careerist in the same sentence because it’s an incoherent repository for the capitalization of life and action: this wolf apparently kills dollars not cows. The only form of harmonious nature available to this economic worldview is the decidedly nonnatural pastoral action of grazing cows “undisturbed” by any possibility of being embedded in a food-chain that extends beyond the human. The end of a “career” like this can only be a spectacular commodity, a stuffed head in a shop that stares out without life, filled as much with the social meanings of total conquest as with the taxidermist’s materials. Photographs too are stuffed heads, instants of animal action removed from context and abstracted into human values. There are many photos of wolves captured, like the stag of Velazquez, as though staring at an implied human observer. To a casual environmentalist, those yellow eyes might look reproachful or have an air of nobility, the nobility of being free from nobility, from human social divisions entirely. To a hunter or rancher it’s the implacable stare of a demonizable competitor or foe. But it’s none of these, it’s what the outside of capital looks like when caught, when seen, from within it.